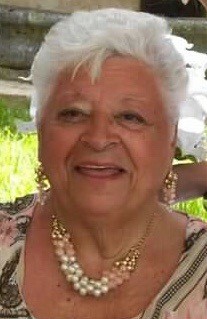 Marie Theresa Tancredi died on Wednesday March 20, 2019 with her children by her side to be with her husband Buddy. She was born on December 15, 1931 in Manhattan, New York. Marie and Buddy raised their children in Rivervale, New Jersey. Marie worked for the Midlantic Bank for many years and was a wonderful seamstress most of her life. They retired to Arizona in 1981. Marie is survived by her children Daniel (Christine) Tancredi, Donna (Wayne) Evans, Grandchildren Thomas (Melina) Evans, Danielle (Frank) Mazza, Great Grandchildren, Zackary Evans and Aria Mazza. Brother Sonny (Hilda) Esposito, Dominick (Antoinette) Esposito,& Sister Theresa (Dominick) Lopano. Her many Nieces and Nephews she adored immensely and wonderful friends and great memories. Visitation is Sunday March 24, 2019 from 2-4:00 PM and 6-8:00 PM. Scripture service will be Sunday March 24 at 7:30 PM. Both the visitation and the scripture service will be held at Messinger Fountain Hills Mortuary. Funeral Mass will be at Church of the Ascension in Fountain Hills on Monday March 25, 2019 at 10:00 AM.